After some time off to catch our breath following September's ridiculously sublime lineup of shows, we belatedly began celebrating Rock-tober last Wednesday with a great evening at Windsor's Phog Lounge (we are back again tonight, Oct. 26, for Rah Rah, We Were Lovers and James O-L and the Villains, review to come). Instead of the Rheostats from Sarnia to kick off the evening-- no, not the RheostatICs-- we got the Rheostat, as it was just band member John Pilat and his guitar. Pleasant enough, but hardly the opportunity to review the band. Windsor-based The Locusts Have No King have been on the Phog bill several times this year and we'd heard the, uh, buzz, and now we know why. We debated how to describe them on the way home, and came up with quirky punkabilly, although with his full dark beard and glasses and slightly nasal vocals, lead singer David Dubois is more folk class than thrash. If you want to check them out yourself, The Locusts Have No King are opening for Nightwood at the Phog next month on the 24th. "Oh my god," someone gasped when Olenka & The Autumn Lovers launched into "Odessa" from their new album, And Now We Sing. The outburst was a reaction to the beauty of the vocal harmonies of Olenka Krakus, violinist Sara Froese and cellist Kelly Wallraff. They're so good the band devoted two songs to "just the girls." "People like it when just the girls sing," Krakus commented with charming naivete. "I don't know why. What's wrong with boys?" Somehow this one flew under our radar: Montreal's The Besnard Lakes are opening for Band of Horses tonight (Friday, Oct. 22) at the Fillmore Detroit. To those of us used to budget-friendly Canadian indie shows, tickets are pricey: $35, not including fees. But if your wallet and schedule allows, we highly recommend The Besnard Lakes. We had the great pleasure of seeing them perform this past June in London, Ont. at Call the Office. The show remains in our Top Ten for the year (and we've had quite a year of shows), as might be expected for a 2010 Polaris short-listed band (for The Besnard Lakes are the Roaring Night). If you like atmospheric, 70s-inspired music that just plain rocks, you'll love The Besnard Lakes, and Jace Lasek's amazingly angelic and pure falsetto vocals. Bonus: seeing a show at the legendary and gorgeous Fillmore Detroit is almost worth the ticket price alone. With a name like Olenka Krakus, a 2008 debut EP titled Warsaw Girl and lyrics like "Oj moja kochana kochana kochana... przepraszam ale wyjezdjamy dzisiaj," it's no wonder Eastern European influences are most frequently cited when describing London, Ontario's Olenka & the Autumn Lovers. But this is not your babcia's polka band. We got to see Olenka & the Autumn Lovers perform at NxEW's NXNE showcase in Toronto this past June; unfortunately the sound in the Gladstone Hotel really didn't do them justice. Olenka's earthy alto voice was clear enough--she can mine the tenor depths or soar into soprano range with ease-- but her band's diverse instruments, including strings, accordion, brass, lap steel, mandolin and glockenspiel were not as distinct as we would have liked. So we're looking forward to seeing them again this Weds., Oct. 20 at Windsor's Phog Lounge. Following the release of two well-received EPs and their self-titled full-length debut, all in 2008, the band is touring in support of their sophomore album released this month, And Now We Sing. Yes, Olenka is still embracing her heritage, but there are plenty of country and folk influences evident as well. Dołącz do na (join us)! an e-mail if you're interested in hiring Tim as a photographer. A lot of things have surprised us since we launched this blog, and one of the most surprising is that according to Blogger stats, the majority of our visitors are from the States. Blogger doesn't tell us where in the U.S. you're reading this, so if you're from Detroit we're (we hope) preaching to the choir. But if not, to paraphrase a vintage catchphrase, we'd like to say a few nice things about Detroit. As longtime and lifelong residents of the metro area, while we think a Canadian indie show in Detroit is a great reason to come to the city, it doesn't have to be the only thing on your agenda. If you're a visiting band with time to kill and or you're coming for a show and want to make a day of your visit downtown, a great place to start is strolling Detroit's riverfront. Although it still has a way to go to rival Windsor's greenbelt across the river, the Detroit Riverfront Conservancy has now completed three miles of walkway along the river. A detailed map is available here. Man-made sights in Detroit are just as interesting as the natural. Detroit is renowned for its historic buildings and their beautiful architecture so just walk around and appreciate the work of great architects like Albert Kahn and Louis Kamper. Or drop by Inside Detroit and sign up for one of their tours, available for as little as $10. Inside Detroit co-founder Jeanette Pierce is passionate about the city and knows more fascinating facts than you've forgotten, guaranteed. You didn't hear it from us, but for the intrepid, Detroit's lost souls abandoned to the ravages of time and neglect offer some prime urban spelunking opportunities. The most infamous is the looming hulk of the Michigan Central Station, which can be seen in the Transformers movies. Don't go in there. Stay away. Blah blah blah. Not into architecture, whether dramatic or decrepit? When English Words, who hail from Charlottetown, PEI, played the Phog Lounge this past April, the die-hard Red Wings fans took time out to tour Joe Louis Arena. Although much of Detroit's retail shopping core is gone, you won't go hungry. Cheap and iconic eats are plentiful; start with Greektown (where several restaurants are open until 3:00 a.m-- Opa!) or Lafayette Coney Island. The barbeque scene in Detroit is also burgeoning; as are microbreweries. 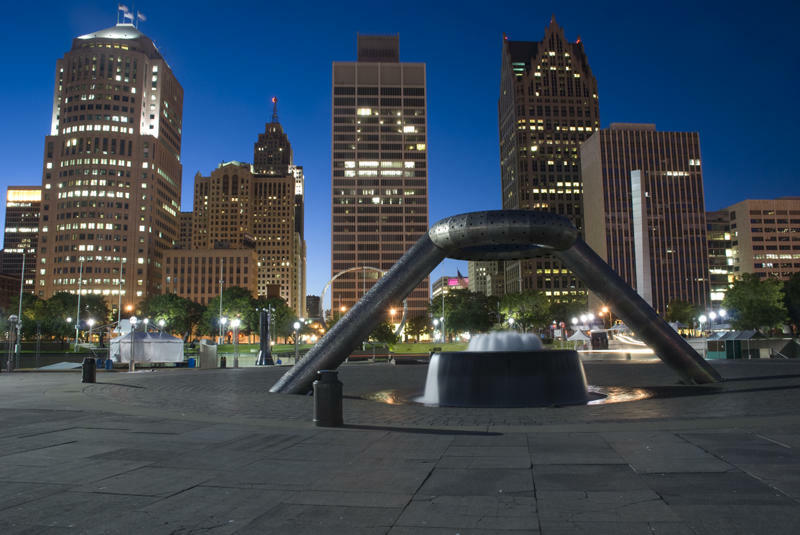 For a detailed list of more than 100 restaurants and bars in Detroit, click here. Another great resource for getting to know Detroit and getting around it is the Detroit Metro Convention & Visitors Bureau. Tell them Go NORTH to Detroit, SOUTH to Windsor sent you. They won't know what the hell you're talking about, but they'll help you anyway. And above all, enjoy the Canadian indie show that brought you here in the first place. Beginning today (Fri., Oct. 1) you can take advantage of nine days of FREE film, arts and music programming at FAM FEST 5IVE, Windsor, Ontario’s largest independent inter-arts festival. Our favourite Canadian indie music venue, Phog Lounge, will be hosting film screenings and of course live music throughout the week, but be sure to check out the complete list of venues and all the great bands participating in the festival.